Garden decking and fencing installation is one of the most popular home improvement projects. You can add useful space to your property and create an area where you can relax and socialise. Decks are especially useful for small backyards and properties with uneven ground. At AC Joinery, we offer expert garden decking and fencing services. Our installers will help you create a private space where you can relax or host parties. What are the Benefits of Garden Decking and Fencing? Garden decks and fences are very useful addition to your home and can increase its value. Most people install decks because they want to utilise the outdoor space on their property more optimally. Here are some of the benefits of decks and fences. A Place To Entertain And Socialise – If you’re fond of hosting dinner parties and small gatherings, you’ll love a garden deck and fence. Your guests won’t be forced to stay indoors when the weather is great because decks would provide a solid and comfortable area to sit, walk, dance, and converse in. Play Area for Your Children – Children often get dirty and muddy when they play on lawns and in gardens. They also bring all that dirt and soil into your home. To a certain extent, garden decking will help you avoid this problem. Decking For Your Hot Tub Or Pool – If you plan to install a pool or hot-tub in your backyard, you need to install deck and fencing. A deck would provide a solid, non-slippery surface while fencing would ensure safety and privacy. Private Nook To Relax In – You can create your own private enclosure in your backyard with garden decking and fencing. You can easily install a deck, a fence, some comfortable chairs, and perhaps an outdoor fireplace or fire pit to create a personal retreat to relax in. We will choose the best deck and fence material based on your preferences and budget. Our company will schedule the project according to your convenience. Our installers will arrive at your location on time and carry out the project at a steady but swift pace. You won’t have to deal with the disruption for too long. 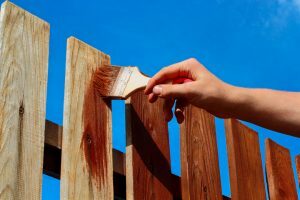 If you want to know more about our garden decking and fencing services here at AC Joinery, don’t hesitate to get in touch with us. You can call us at 0161 980 7992 or contact us through our web form today, we are located in Hale and can reposnd to requests from Hale, Alrincham, Timperley, Sale, Brooklands, Northern Moor and surrounding areas.